Hold down spacebar while pressing a key to launch or switch to an app. Launch an app, open a website, or run a script. Spacebar A W E S O M E -> launch your AppleScript to say "you are awesome"
SpaceLauncher is smart to recognize it. Don't memorize. Just practice. Your fingers can memorize them easily. depending on your typed keys after pressing spacebar down. Moreover, only rarely used actions are highlighted (the keys used recently are gray), so you can find out the action you actually need quickly. Feel safe to download. The app is signed, and it will not connect the Internet without your permission. How to type a lot of spaces continuously? but if you really need it, hold shift and spacebar. From SpaceLauncher 1.2, you can type spacebar, then press and hold it quickly (by defaults in 0.2 seconds, you can set it in the option "Disable SpaceLauncher for 0.2 seconds after your last typing"). What does the option "Disable SpaceLauncher for 0.2 seconds after your last typing." mean? Why do I need it? You might notice that, in most case, you type a space quickly after finishing a word. This space shouldn't be treated as SpaceLauncher's hotkey. This option means, if you type a space in 0.2 seconds after your last keystroke, the space will be ignored by SpaceLauncher. What does the option "After space key down, ignore pre-defined keys within 0.2 seconds" mean? Why do I need it? If the above option "Disable SpaceLauncher for 0.2 seconds after your last typing." works for you, just ignore this option. If you often trigger SpaceLauncher actions when inputting text, that is because you type fast so that the letter after space go before releasing spacebar. This option gives a delay. After you pressing spacebar, SpaceLauncher waits for a delay, then start to recognize keys for actions. What's wrong with the hint window? Some rows are gray. This is intended. The keys used recently will be gray. The keys never used or used several weeks ago will be white or less white depending on your last usage. I also considered reordering the rows in hint window to show less used rows first. But I noticed if I referred to a row several times, I would expect it to appear in the same place. Reordering made me difficult to locate it. Can I change the hint window's location and size? Yes, you can. Holding spacebar until the hint window appears, then you drag the title bar to move the window, or drag the edge to resize width (height will be changed automatically depending on contents). Can I change the hint window's appearance or theme? No, you can not, at least not now. I lack confidence in user interface design, so I just chose the native Translucent Panels. If you think the hint window is really ugly, let me know. No, SpaceLauncher is a paid application. You can try SpaceLauncher without limitation forever, but after trials, you should purchase for further use. You can also find my free apps/tools on my GitHub page. Are you going to add new features? There are lots of features I wanted to add when I make SpaceLauncher. I had to stop myself to add new features before release. e.g. Support synchronization and/or import/export preferences. Show current hotkeys in menu bar extras. Thanks to AppleScript, most of these can be implemented via AppleScript. But making them native in SpaceLauncher will be more user-friendly. Before that, you can try AppleScript for your customization. Let me know what you have done with AppleScript or what you are going to do with AppleScript if I can help. And don't forget, tell me the new feature you want. You make SpaceLauncher better! How to launch an AppleScript to say "you are awesome"
In Script Editor, type say "you are awesome", save as Application or Script. 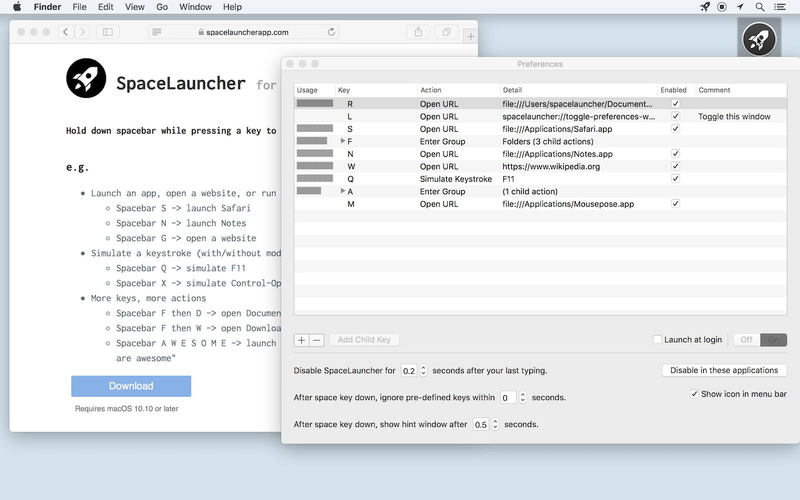 In SpaceLauncher, add an action to open URL, choose the AppleScript file. I see the menu icon is changing, what's happening? The icon indicates the state of SpaceLauncher. SpaceLauncher is ready, you can press spacebar. You are holding spacebar for SpaceLauncher. You can press a pre-defined key now. You are typing. SpaceLauncher ignores typed spacebar. I try to make the change unobtrusive. You also can uncheck "Show icon in menu bar" in preferences to hide the icon.